Alexia Detweiler is a freelance writer in Lancaster, Pa. When she’s not in the kitchen cooking, you can find her sweatin’ it up in hot yoga, or beating the crap out of a heavy bag at the boxing gym, depending on her mood. While this breakfast cereal originated in Switzerland, muesli has now become a staple in many European countries. It’s easy enough to buy at the store, but there are so many flavor combinations to experiment with when you make it yourself. Russia is predicted to place in the top three in gold medal tally predictions. But the country doesn’t get that ranking on toast alone. Try this family recipe for cheese blinis to give you the strength and energy to be the best…um…spectator you can be. Ice cream for breakfast may seem like a no-no, but in Italy, it’s a remedy to beat the heat. I don’t recommend it before competing in an Olympic event, but if you need something sweet to cool you down before a long day in front of the TV, try this Sicilian pick-me-up, Granita al Caffè Con Panna. 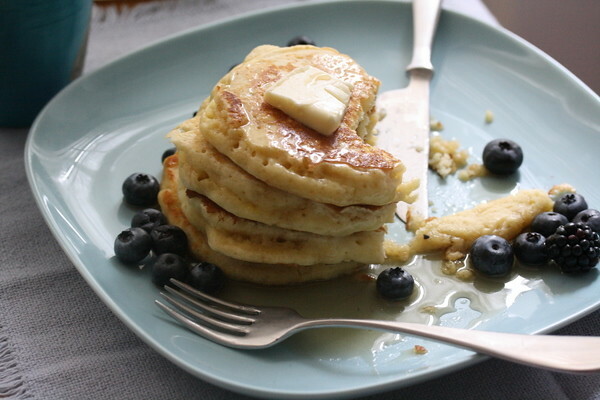 There’s nothing better than good ol’ ‘merican flapjacks. What they lack in nutritional value, they make up for in taste and fluffiness. This weekend Londoners everywhere will be eating the classic British breakfast, beans on toast. It’s simple, it’s cheap and it’s British. If you’re not into fancy pastries or hearty sausages, this dish will provide you everything you need for the day: protein, carbs, and the impression that you’re a Brit–at least for 15 minutes.